New regulations • Higher speeds will soon be allowed on I-80, I-15 and I-84. 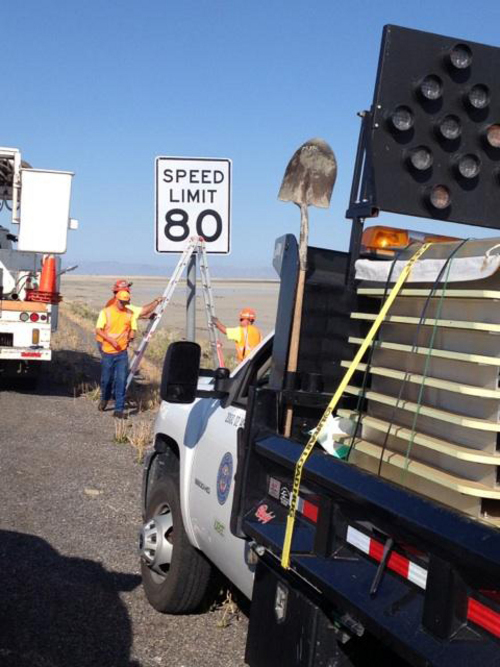 | Courtesy UDOT Utah Department of Transportation crews install new 80 mph speed zone signs west of Tooele. Utah has just added 289 extra miles of 80 mph speed zones. 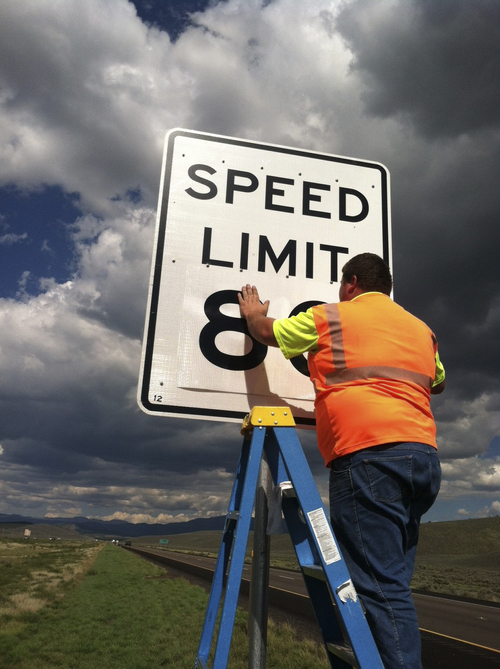 | Courtesy UDOT Utah Department of Transportation crews install new 80 mph speed zone signs west of Tooele. Utah has just added 289 extra miles of 80 mph speed zones. 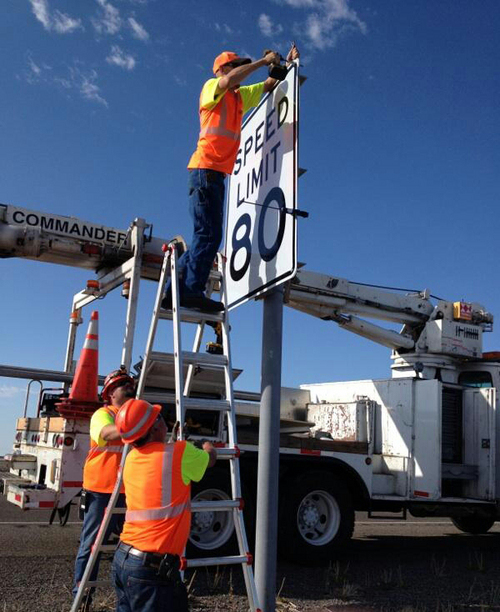 | Courtesy UDOT Utah Department of Transportation crews install new 80 mph speed zone signs west of Tooele. Utah has just added 289 extra miles of 80 mph speed zones. And they&apos;re off: Utahns now have 289 extra miles of highway with 80 mph speed limits  or will as soon as crews finish posting the new signs during the next week or so. • Interstate 80 from the Nevada border to milepost 99, near Tooele. • Interstate 84 from the Idaho border to its intersection with Interstate 15 near Tremonton. • Interstate 15 from the Idaho border to milepost 366 near Brigham City. • Another 116 miles of I-15 in southern Utah. Combined with previous 80 mph zones there, such zones will now extend almost all the way from Santaquin to Leeds (north of St. George). However, some mountain passes and the area around Cedar City still will have lower speed limits. Earlier this year, the Legislature passed HB83 by Rep. Jim Dunnigan, R-Taylorsville, to allow the Utah Department of Transportation to study 80 mph speed limits in those areas, and add them where it is safe. Sen. Scott Jenkins, R-Plain City, HB83&apos;s Senate sponsor, told lawmakers it was "the coolest bill of the whole year." Robert Hull, UDOT&apos;s director of traffic and safety, said studies found it would be safe to add the 80 mph zones almost everywhere the Legislature had allowed them. "Based on our engineering judgment, there are a couple of mountain passes and the section through Cedar City where we retained a slower speed limit because of issues with geometry, and in Cedar City because we have a lot more traffic entering and exiting there," Hull said. UDOT studied how fast people were already driving in the areas with the new 80 mph zones. Hull said the vast majority were going between 80 and 82 mph on the stretches, which previously had a speed limit of 75 mph. "That&apos;s indicating the majority of the drivers feel safe and are driving prudently at those speeds, 82 and below," Hull said, and now that will be legal. In previous studies of 80 mph zones tested over several years on I-15, Hull said, the average speed increased by only 1 mph  which is one reason the Legislature said it was safe to expand those zones. "Again, people were already driving at that speed and felt comfortable and safe,", Hull said. UDOT will continue to study speeds, he added, to ensure that they do not rise significantly. While the old 80 mph zones were seen as temporary test zones for years, they and the newly added 80 mph zones are now considered permanent, Hull said. UDOT believes no further testing of them is needed because of the years of studies conducted already in southern Utah. Not everyone is ecstatic about the higher speed limits. Rolayne Fairclough, spokeswoman for AAA Utah, says insurance companies will be watching closely to see how it may affect accidents, and maybe rates. UDOT previously said it found no fatal accidents related to speed in earlier test 80 mph zones. But "high speeds bring more fatal crashes" because "when you increase speed, the force in crashes increases," Fairclough said. "Be sure you are very alert when you go onto high-speed roads so that you are not at all drowsy and your reaction times are good. Be careful, cars are coming up far quicker than ever before." House Democratic Leader Jennifer Seelig, D-Salt Lake City, was one of only five legislators who voted against the 80 mph zone bill. She said Tuesday she did so because she worried it could lead to more fatalities, and also because "when highway speed are increased, it results in increased emissions" and air pollution. Crews have already installed signs for 80 mph zones on the southern part of I-15. They also will be posting them during the next couple of days on I-80. UDOT just gave final approval Monday night for sections on I-84 and the northern part of I-15, and Hull expects signs to be posted there within a week. "We encourage folks to adhere to the speed limits," Hull said, "and always buckle up." Texas and Utah are the only states that have speed limits of 80 mph or higher. Texas allows 85 mph on one toll road. "But there are many states that are reviewing the maximum speed limits right now," Hull said.